No one ever said “trendy” translates to “cheap.” Yet when it comes to on-trend, luxury upgrades, you don’t have to spend like a diva to make your bathroom look and function like a designer’s dream. 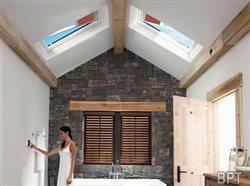 From skylights to shower seats, some of the hottest bathroom trends of 2014 are surprisingly affordable to accomplish. Many Houzz respondents said they would like a skylight in their bathroom. They’re definitely on to something. In rooms where privacy is a concern, skylights can provide both natural light and ventilation without exposing your personal business to the neighbors. They’re both beautiful – endowing bathrooms with a major “wow” factor – and practical; Energy Star-qualified no-leak, solar-powered fresh-air skylights from Velux America can help trim electricity costs by providing natural light and passively venting moist, warm air from the room. Install solar-powered skylights and blinds, and the cost of the products, as well as the installation, can qualify for a 30 percent federal tax credit. And for 10 weeks during the summer there’s also a $200 cash rebate from Velux on solar skylights. You can create a big impact for a small price with a makeover that only takes a couple of days. Visit http://www.whyskylights.com to learn more and to locate the closest certified installer. In keeping with the lighting theme, 41 percent said they would like a lighted vanity mirror. Home improvement stores, design studios and online retailers carry a wide variety of options in shapes, sizes, styles and light sources (LED, CFL or incandescent) to suit virtually every taste. Because installing a lighted vanity mirror is a simple do-it-yourself job, it’s also a very low-cost improvement that has a big impact on a bathroom’s appearance and usability. With such a huge variety, it’s possible to find a mirror that will fit your budget, whether it’s less than $100 or more than $1,000. The ongoing trend of making homes greener may have helped inspire the 23 percent of Houzz fans who said they want a double-flush toilet. Dual-flush toilets allow you to use only the water you need to get the job done – less for liquid waste, more for solids – so they contribute to a home’s overall footprint and can help trim water bills. It’s possible to find dual-flush options for less than $250, so they’re a lower-cost upgrade to begin with. They’re even more cost-effective when installed by a savvy DIYer. Who doesn’t love the comforting warmth of a towel fresh out of the dryer? Towel warmers deliver that effect without the hassle and expense of running the dryer. Wall-mounted or free-standing, plug-in or hard-wired, all towel warmers work the same way; heated bars warm towels hung on the rack, providing a cozy, warm towel every time you bathe. Plug-in versions install easily, while hard-wired ones may require professional installation. Prices can range from less than $100 to more than $600, depending on the style and features you choose. Clearly, this is one improvement that most benefits the women in a home, but 10 percent of those polled by Houzz said they wanted a foot rest in the shower. This one is such an economical improvement, you may wonder why anyone wouldn’t do it. Some suction-cup styles cost under $20. For a more refined look or enhanced sturdiness, it’s possible to find one that anchors into the wall through screws, or a style built into shower surrounds. If you’re redoing your shower stall, it’s the perfect time to add a stylish, sturdy foot rest. Are you in need of a bathtub remodeling expert?